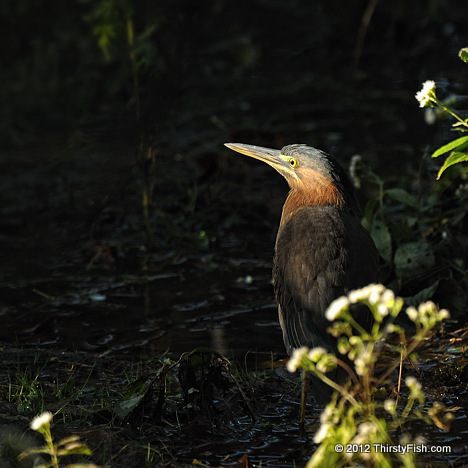 The Green Heron is more a dark slate blue, than green. This one was hiding in the marsh, until we spotted each other. I snapped this shot as she took a few steps into the sunlight. Some languages traditionally do not distinguish blue from green. Although this might sound odd to some us, we also use ambiguous names for colors in the English language. For example, we interpret a range of colors between red and blue, that are not red or blue, as the color purple. Some colors, like those of the rainbow, red, orange, yellow, green, blue, indigo and violet are spectral colors. Other colors, such as magenta, rose and purple, are merely mixtures of spectral colors. White, black, and gray are not actually colors at all; they are achromatic (neutral).